If there’s one thing US presidential hopeful Donald Trump and Mexican President Enrique Pena Nieto have in common, it’s that they’re both doing terribly in the polls. Yet things may have just gotten a lot worse for one of them. Pena Nieto’s spontaneous meeting with Trump Wednesday was a risky gamble – one that’s now totally backfired on both him and Mexico’s ruling party, the Institutional Revolutionary Party (PRI). “He was really looking for trouble with this meeting,” said veteran Mexican journalist and editor in chief of Caribe News, Olivier Acuna. The meeting itself totally caught many in Mexico by surprise, with the president only publicly confirming the event just hours in advance. 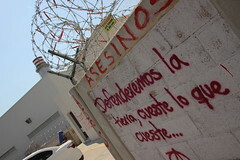 Reportedly, much of the Mexican government was totally in the dark about the visit until Wednesday morning. 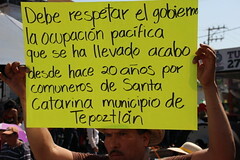 According to Acuna, Pena Nieto was expected to elicit an apology from Trump for his incendiary language towards Mexicans living in the United States. When Pena Nieto failed to deliver, the meeting became the “cherry on top” of a series of scandals and political setbacks for the deeply unpopular president. So Why Did Pena Nieto Meet Trump in the First Place? For months, Pena Nieto’s numbers in the polls have been going from bad to worse, amid mounting political scandals. According to a poll commissioned by newspaper Reforma in August, the president’s approval rating now sits at 23 percent, making him one of the least popular leaders in the hemisphere. This dismal performance was also the worst ever recorded by Reforma since it began publishing regular presidential surveys in the mid 1990s. 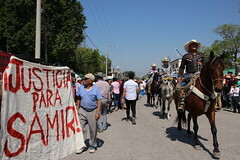 Since coming to office, Pena Nieto has presided over a government lashed with regular allegations of corruption, and facing almost daily protests. 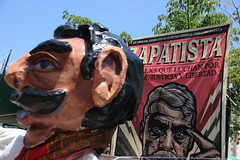 His trademark package of education reforms has sparked months of teacher protests in the southern states of Chiapas and Oaxaca, while the 2014 kidnapping of 43 student teachers in Guerrero prompted months of nationwide demonstrations. In August alone. 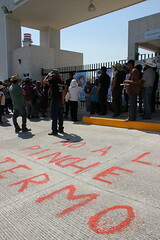 Pena Nieto’s administration was publicly embarrassed by three separate scandals. First, there were the allegations that Pena Nieto plagiarized around a third of his thesis as a law student in 1991. Then, Mexico’s federal police chief was forced to resign amid allegations officers arbitrarily executed at least 22 suspected drug criminals. Just days later, an investigation by the UK’s Guardian newspaper uncovered allegations Pena Nieto’s wife Angelica Rivera used a luxury home owned by a potential government contractor. The revelations led to accusations of a possible conflict of interest between the president and the potential contractor. To add to Pena Nieto’s woes, the country has seen an uncomfortable economic downturn. In 2015, low oil prices, slowing investment and shrinking public expenditure all contributed to the peso losing around 30 percent of its value to the greenback. Things haven’t improved much since, with the country’s economy actually contracting by 0.2 percent in the second quarter of 2016. In short, the economy just isn’t doing Pena Nieto any favors. Throughout 2016, the myriad of scandals, controversies and the economic downturn have all become regular fixtures of newspaper front pages, and generally dominated the news and public discourse across Mexico. Trump, however, has momentarily changed that. On Wednesday morning, many of Mexico’s major newspapers ran the meeting between Pena Nieto and Trump as a front page story. In Mexico City’s newspaper Capital, the Trump story was touted on the front page. Meanwhile, a study showing over 80 percent of Mexicans believe living conditions are deteriorating was relegated to page five. Another hot topic, education reform, managed to fall all the way back to page eight. A similar story prevailed online. 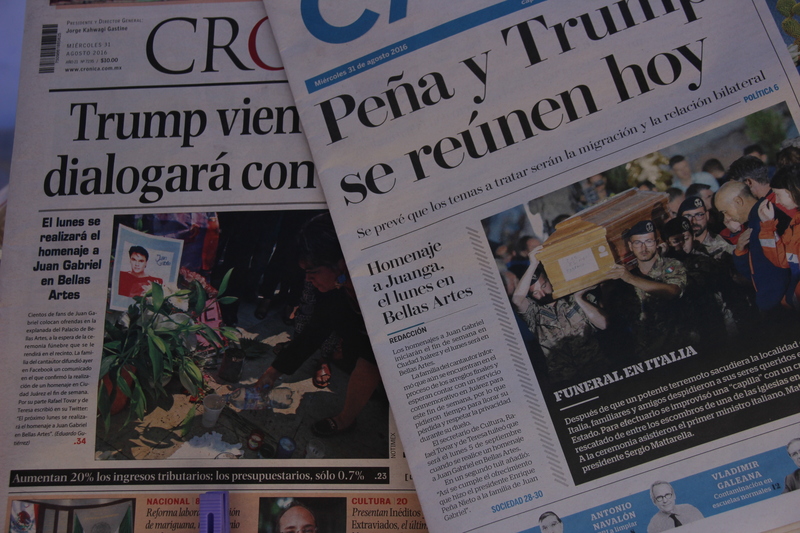 Mexico’s most left-leaning major newspaper, La Jornada, carried three headline stories plus an op-ed about Trump’s visit on its website Wednesday. 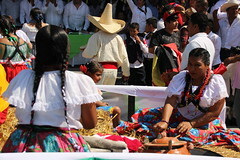 They placed the latest news on the Nochixtlan massacre near the bottom of the homepage. It seems Trump makes for popular reading, even in Mexico. “Not federal police executing people. Not the missing students. Not his plagiarized thesis,” he tweeted. “There’s only one problem with this plan. Trump may well hijack that narrative, frame the meeting to his advantage and then straight-up lie about the details in Arizona with a straight face,” Pena said. The only thing Pena got wrong was that Trump’s story of the meeting didn’t start deviating from Pena Nieto’s account during the Arizona speech. Instead, Trump started much earlier. Speaking to the press shortly after the meeting, Trump said he and Pena Nieto didn’t discuss his plan to make Mexico pay for the supposed border wall. On top of this, the press conference with Pena Nieto and Trump was lackluster and subdued. Trump’s rhetoric on immigration was softer than in the past, but no apology was tabled. Pena Nieto made no serious attempt to dominate the conference, let alone wrangle any concessions from Trump. In other words, the meeting was a total disaster. Instead of looking like a strong leader, Pena Nieto appeared to be fraternizing with a man he once compared to Adolf Hitler. It’s worth noting at this point that Pena Nieto’s motivations for the meeting weren’t much different to Trump’s. A CBS poll in late July put Trump in a dead heat with his Democrat contender Hillary Clinton. A CNN/ORC poll released around the same time even showed Trump leading Clinton by three percentage points. Skip forward to Wednesday, and Trump’s campaign was in the gutter. An Washington Post-ABC News poll released on the day of the Mexico meeting showed Trump’s disapproval rating at 63 percent, versus an approval rating of 35 percent (Clinton’s numbers were 56 percent and 41 percent respectively). Trump tends to perform best in the polls when he sticks to doing that one thing he does best: acting unexpectedly. As Acuna pointed out, Trump had little to lose from taking Pena Nieto on, but plenty to gain. A tough stance could appeal to his base, while a softer tone certainly couldn’t push any more Hispanic voters away. In either case, nothing makes a presidential candidate look presidential more than a trip abroad. Although both figures came to the table while facing very similar situations, in the end it was Trump who came out on top. “It seems logical this was more about Trump than it was about Pena Nieto,” he said. The only person in the room who didn’t seem to realize this was Pena Nieto himself. According to Acuna, the meeting is now likely to go down as one of a handful of “defining moments” in Pena Nieto’s presidency. “The PRI is pretty much at the end of the road,” he said, arguing the party will likely be forced to heavily rebrand itself in the coming years. It may even eventually collapse, Acuna tentatively opined. He suggested this would largely be due to Pena Nieto’s poor decision making throughout his term, with the Trump miscalculation being just one of many examples. For a party once seen as synonymous with the Mexican state, the PRI’s disastrous run under Pena Nieto will inevitably be looked back on in the future as an abysmal failure in the country’s history. Whether Acuna is right and the PRI will fall into crisis in coming years is yet to be seen, but undoubtedly Pena Nieto’s term has been characterized by missteps and poor judgment. His meeting with Trump may indeed be remembered as the cherry on top.